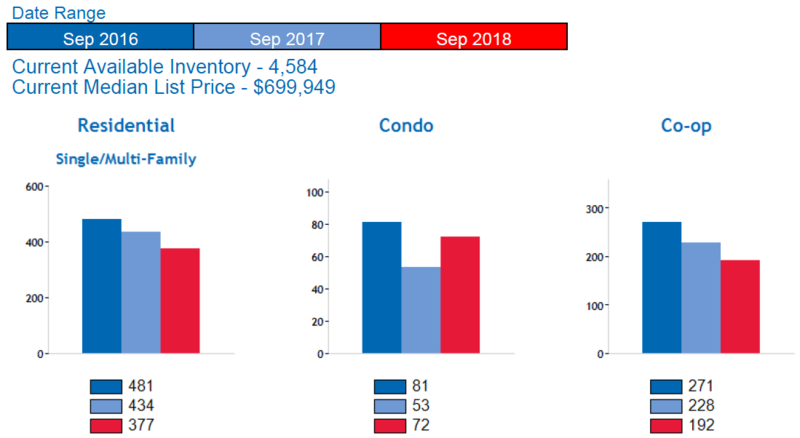 Queens Real Estate Market Report October 2018, provided by the Queens Home Team at Keller Williams Realty Landmark II. Need help? Feel free to Contact Us anytime. Fall is here, so jackets, hoodies and flannels are all in full swing. Weather is cooling down, and the market is doing a little of the same. In September and October we’ve seen a slight dip in the amount of inquiries on our listings and a slight decrease in the amount of online traffic, but for our properties that ar priced well, they are still getting a lot of activity. Overall things seem to have slowed a bit on the buyer side, while on the seller side, things seem to have picked up. This month we’ve listed 5 new properties and we may have a few more more coming as well. 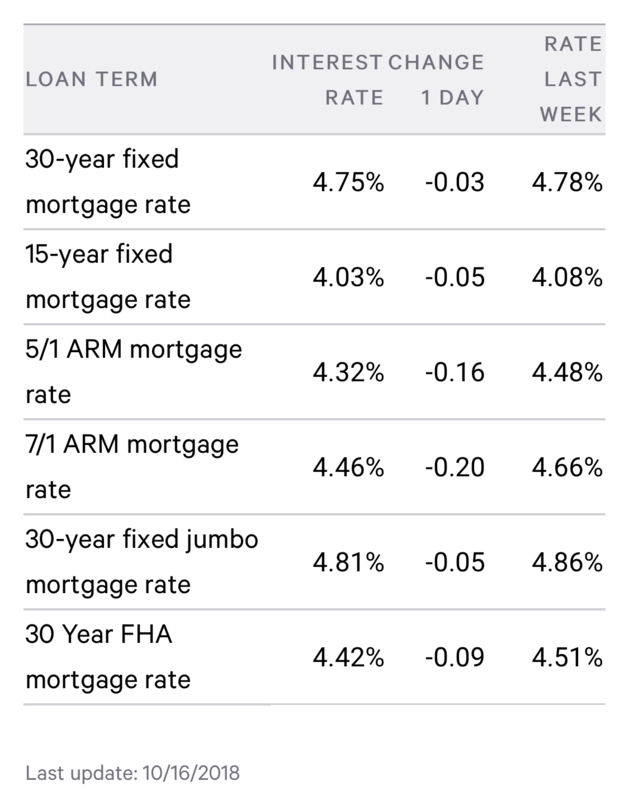 The issue we’re noticing right now is that interest rates went up again and as with every other interest rate increase we’ve seen this year, the impact on the market is almost immediate. We spoke to a few lenders to see how they’re doing and most of them told us that approvals are down. Still, they said that they have a lot of buyers who are looking, but many of them are starting to venture out into different neighborhoods where they can get more bang for their buck. Regarding home sales, they have continued to slow this year and the reason is varies depending on who you talk to. 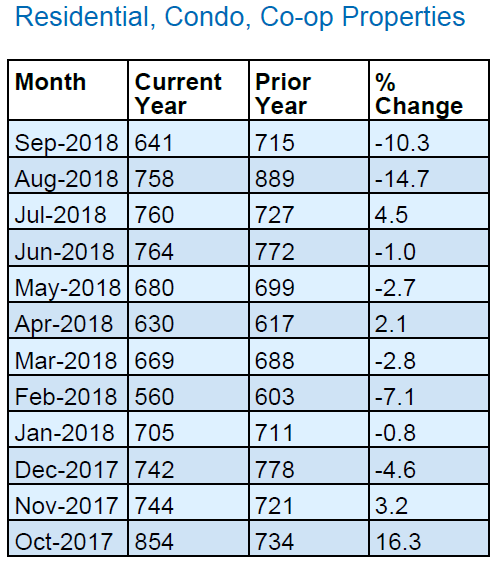 Either way, in September, home sales dropped by 10.3% compared to September of last year, and if you keep up with this report, then you probably recall that last month home sales dropped by 14.7% compared to August of last year. These are the two biggest year-over-year decreases we’ve seen this year and they were seen in two consecutive months. We’ll have to see what happens over the next 2-3 months to see if this is a trend, or just a singular event. 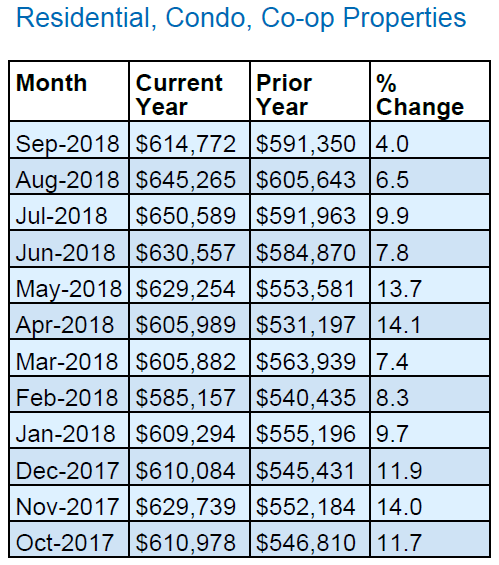 As for home prices, the median home price is still up year-over-year, although not as significant of an increase as we’re used to here in Queens. In September, the median home price increased 6.6% compared to September of last year. When you break that down by property type, the numbers are even more modest. For example, the median price for residential homes in Queens is up 2.1%, the median price for Queens condos is up 2%, and the median price for Queens coops is up 11.3% compared to the same month last year. This lets us know that while prices are still up, the distribution of where they are rising is uneven. Right now it looks like coop prices are up the most and this is most likely because they are the most affordable option for entry level buyers in Queens. When it comes to inventory, we currently have 4,584 homes for sale in Queens. This is up 20.6% compared to October of last year and up 2.6% compared to last month. To put that into perspective, last year at this time, we had about 3,800 homes for sale, and right now we have about 4,600 so that’s almost 800 more homes for buyers to choose from. This increase in inventory, coupled with the recent interest rate increase may continue to impact buyer demand which ultimately can have an impact on supply as well. Curious what’s happening in your neighborhood? Request a free local market report today! What is Month’s Supply? Months of supply is the measure of how many months it would take for the current inventory of homes on the market to sell, given the current pace of home sales. For example, if there are 50 homes on the market and 10 homes selling each month, there is a 5 month supply of homes for sale. Months of supply is a good indicator of whether a particular real estate market is favoring buyers or sellers. Typically, a market that favors sellers has less than 6 months of supply, while more than 6 months of supply indicates an excess of homes for sale that favors buyers. What is Absorption Rate? Absorption rate is the rate at which homes sell in a given area during a given time period. Absorption rate is calculated by dividing the number of sales in a given month by the number of available homes for sale. For example, if there are 100 homes listed for sale in a certain area, and 10 homes sold over the last month, then the absorption rate is 10/100 = 10%. Being that closed sales are a lagging indicator, we calculate Absorption Rates using pending sales from the previous month and this gives us better insight as to where the market is right now. An absorption rate of 20% or higher means that homes are selling quickly and the market favors sellers. Lower absorption rates mean that homes are not selling quickly and supply is much greater than demand, favoring buyers. The Long Island Board of Realtors reported Queens home sales at a rate of approximately 641 homes during the month of September. This was an increase of 15.4 percent from August and a decrease of 10.3 percent from September of last year. Specifically, our Queens real estate market report October 2018 shows that Residential home sales were DOWN 13.1%, Queens Condo sales were UP 35.8%, and Queens Coop sales were DOWN 15.7% compared to September of last year. Over the last 6 months, Queens home sales are DOWN __%. 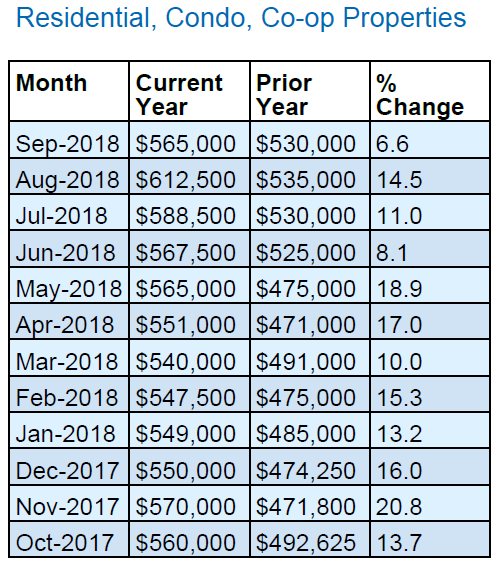 The median home price in Queens dropped to $565,000 in September, this is a decrease of 7.8 percent from August, and an increase of 6.6 percent compared to September of last year. The median home price has increased by approximately $35,000 since last year. 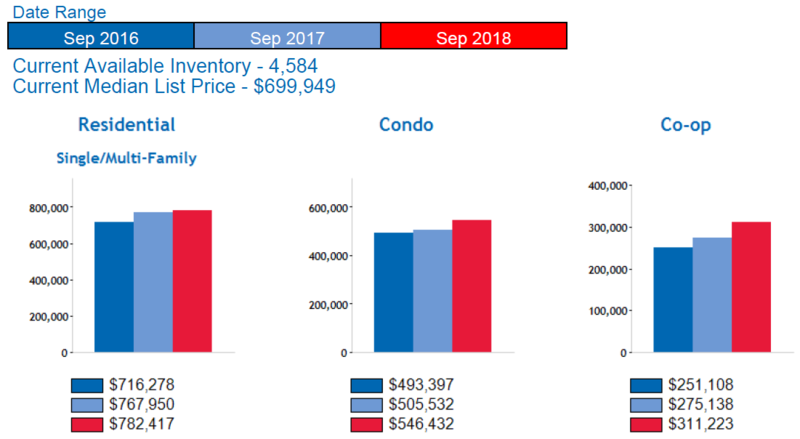 Specifically, our Queens real estate market report October 2018 shows that Queens residential home prices are UP 2.1%, Queens Condo prices are UP 2%, and Queens Coop prices are UP 11.3% compared to September of last year. Over the last 12 months, the median home price in Queens is up 12.2%. There is currently a 6.5-month supply of housing inventory in Queens, this is up slightly from the 6.4-month supply we had in September, and up from the 5.3 month’s supply we had in October of last year. There are currently 4,584 homes for sale in Queens. This is an increase of 2.6 percent compared to last month, and an increase of 20.5% compared to October of last year when there were 3,802 homes for sale in Queens. Queens real estate market report provided by the Queens Home Team at Keller Williams Realty Landmark II.